Dr Peter Middleton and I have had our “Lean Software Management BBC Worldwide Case Study” paper accepted by the IEEE Transactions on Engineering Management. It will be published in the February 2012 issue. The paper was edited by Dr Jeffrey K Liker, author of the Toyota Way. You can download a copy of the paper prior to its publication here. I believe it will be one of the most significant papers in Software Engineering this decade. This case study examines how the lean ideas behind the Toyota production system can be applied to software project management. It is a detailed investigation of the performance of a nine person software development team employed by BBC Worldwide based in London. The data collected in 2009 involved direct observations of the development team, the kanban boards, the daily stand-up meetings, semistructured interviews with a wide variety of staff, and statistical analysis. The evidence shows that over the 12-month period, lead time to deliver software improved by 37%, consistency of delivery rose by 47%, and defects reported by customers fell 24%. The significance of this work is showing that the use of lean methods including visual management, team-based problem solving, smaller batch sizes, and statistical process control can improve software development. It also summarizes key differences between agile and lean approaches to software development. The conclusion is that the performance of the software development team was improved by adopting a lean approach. The faster delivery with a focus on creating the highest value to the customer also reduced both technical and market risks. The drawbacks are that it may not fit well with existing corporate standards. The paper doesn’t include the increase in business value delivered over the period of study. This was due to confidentiality agreements. What I can say is that during the period of study, the digital assets produced rose by hundred of thousands of hours of content, a 610% increase in valuable assets output by software products written by the team. Peter Middleton received the M.B.A. degree from the University of Ulster, Northern Ireland, in 1987, and the Ph.D. degree in software engineering from Imperial College, London, U.K., in 1998. He is currently a Senior Lecturer in computer science at Queen’s University Belfast, Northern Ireland. He is the coauthor of the book Lean Software Strategies published in 2005, and the Editor of a book of case studies on applied systems thinking: the Delivering Public Services that Work published in 2010. His research interests include combining systems thinking with lean software development to help organizations significantly improve their performance. David Joyce is a Systems Thinker and Agile practitioner with 20 years software development experience of which 12 years is technical team management and coaching experience. In recent years, David has led both onshore and offshore teams and successfully led an internet video startup from inception to launch. 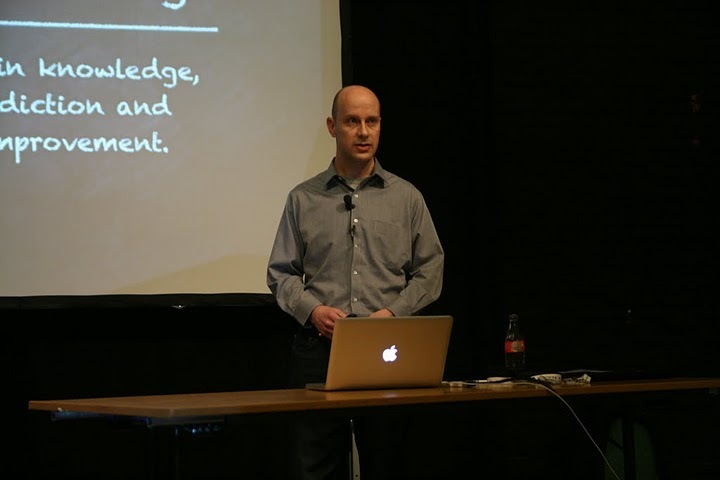 More recently David has coached teams on Lean, Kanban and Systems Thinking at BBC Worldwide in the U.K. 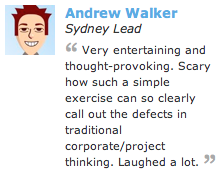 He is a Principal Consultant at ThoughtWorks. Great video from managers and consultants who have learned that successful change can’t be done through tools, success requires a change in thinking. I have read various books, articles, blog posts, slide decks, or attended presentations, or have spoken to Lean practitioners who tell me about Lean’s 14 Principles, or Lean’s 5 Principles, or the 5 Pillars of Lean. This can become very confusing and typifies our lack of understanding of the TPS. Which do you use? There is no pure lean approach as demonstrated by the different descriptions of lean in the literature, which identifies a range of overlapping lean principles. Ohno’s  focus was to reduce the time from customer order to product delivery by eliminating waste. Arguably he preached many principles, even though they are not laid out as such. The complexity of analysing lean is due to the specifics of each lean implementation being context dependent. When Toyota was setting up a new plant in America, Liker and Hoseus noted that Toyota ‘‘. . .were not interested in teaching us to copy. They were trying to teach us to think and act in the Toyota Way’’ [6, p. xxii]. Therefore, for Toyota, it was more a philosophy of management combined with their experience of what was successful that was important. Deming reminds us about the hazards of copying in his book Out of the Crisis. Improvement of quality is a method, transferable to different problems and circumstances. It does not consist of cookbook procedures on file ready for specific application. It is a hazard to copy. It is necessary to understand the theory of what one wishes to do or make. We are great copiers. The fact is that the Japanese learn the theory of what they wish to make, then improve on it. This idea of copying reminds me of a great story from Deming, again in his book Out of the Crisis. The management of a company that makes furniture, doing well, took it into their heads to expand their line into pianos. Why not make pianos? They bought a Steinway piano, took it apart, made or bought parts, and put a piano together exactly like the Steinway, only to discover that they could only get thuds out of their product. So they put the Steinway piano back together with the intention to get their money back on it, only to discover that it too would now only make thuds. J. K. Liker, The Toyota Way: 14 Management Principles from the World’s Greatest Manufacturer. New York: McGraw-Hill, 2004. J. P. Womack and D. T. Jones, Lean Thinking. London: Touchstone Books, 1997. S. Shingo, A Study of the Toyota Production System. Portland, Oregon: Productivity Press, 1981. 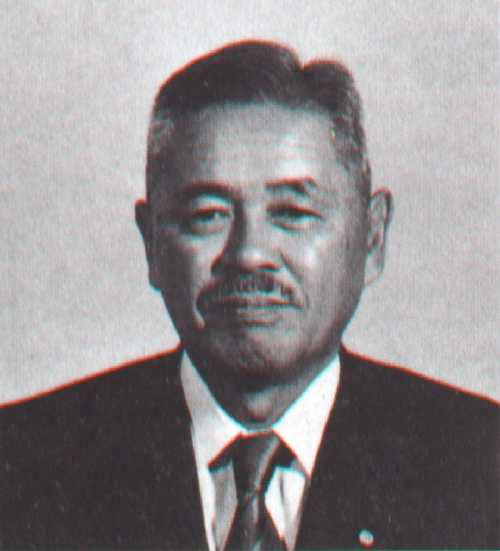 T. Ohno, Toyota Production System: Beyond Large-Scale Production. Portland, Oregon: Productivity Press, 1988. J. K. Liker and M. Hoseus, Toyota Culture: the Heart and Soul of the Toyota Way. New York: McGraw-Hill, 2008. Lean is About Eliminating Waste Right? Some people think that waste elimination is what Lean is all about. This is music to managers ears. What manager or leader would not jump at the chance of finding waste in their organisation, having it removed, and reducing costs as a result? As a consequence Lean consultants enter an organisation, waste is found; for example staff are found sat around doing nothing or waiting for something or not “behaving” efficiently, and the waste is removed (often as a consequence FTEs are removed) and success is claimed. But does this lead to being more effective? This has bothered me for sometime. I have met many Lean consultants who talk only of waste elimination, they know nothing about the need for understanding customer demand and have little appreciation of the differences between being effective vs being efficient. Many have only read books written about the TPS, and have little or no knowledge of Taylor, Ford, Sloan, Deming, Taguchi and Ohno. Is this correct? Here is an interesting extract from a recent post by Jim Womack (co-authored the book “The Machine that Changed the World”). A powerful post. Jim is articulating what I have felt uneasy about. A large survey conducted by Industry Week in 2007 found that only 2 percent of companies that have a lean program achieved their anticipated results. More recently, the Shingo Prize committee, which gives awards for excellence in lean manufacturing, went back to past winners and found that many had not sustained their progress after winning the award. The award criteria were subsequently changed. Dr. Keivan Zokaei from the Lean Enterprise Research Centre (founded by Daniel T Jones who co-authored the book The Machine That Changed the World) has much to say on the subject. Efficiency thinking is setting the quality level as “good enough” we don’t need to strive for perfection. Effectiveness thinking is thinking about the lifetime of a product (and the effects on the whole organisation “system”) which in the long run will cost less. If we do it right first time (which might be more costly at the outset), it actually saves our organisation money in the long run). Effectiveness is doing the right thing. Efficiency is doing things right. Many “Lean” organisations could be doing the wrong things righter. Making things efficient that shouldn’t be done in the first place. Doing a lot of efficient things but not effective things. This is what Toyota turned on its head, following the work of Taguchi. Let’s do the right thing first, THEN we will make it efficient. With the focus on waste removal we are not looking at variation in demand. There are times in the process when sometimes demand increases capacity and other times it doesn’t. The problem with focusing only on waste removal, and not understanding demand, is that after waste removal, when a high level of demand comes in, the organisation cant cope, we clog up the flow, we introduce waste that we tried to remove in the first place! Toyota bizarrely built in up to 50% extra capacity into their system. They called it 8-4-8-4 (8 hours of work, 4 hours to do other things). 50% waste built into the system! If a Lean consultant, who didn’t understand variation of demand, went into that organisation they would remove that “waste” and claim it as a success The result? Toyota wouldn’t be anywhere near as successful as they are now. Rather than utilising capacity it is better to be responsive, to be able to respond when demand arises; keeping spare capacity. 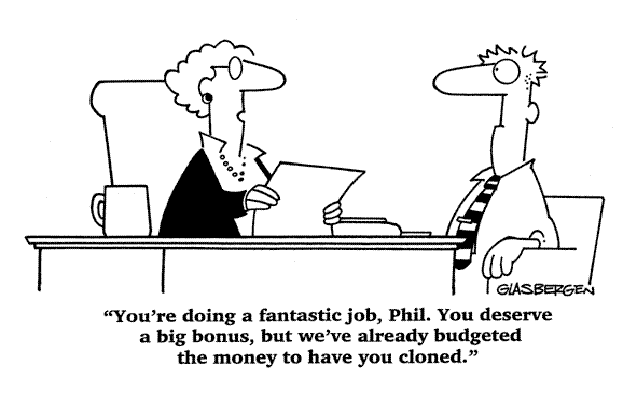 What would your boss say if you asked to have 20% spare capacity for times when demand might exceed your capacity? In the West its all too predictable what the response would be. Is it? What’s confusing is that Ohno did talk about Muda (waste); idle machines and idle people, which all looks like waste on the surface. But he also talked about having machines (and people) available when demand comes along, he talked about resourcing to the upper level (we are guaranteed to have someone/machine available when the work comes), which means that at times they would have to be idle. Ohno talked about Muri (overburdening of people and equipment) being a root cause of waste. He talked about Mura (unevenness in operations) and the need for understanding fluctuations in demand, that variation needs to be understood well within the system. Ohno explained this is why Toyota went out to the dealerships to study that demand, with the aim of producing cars at the rate of customer demand. Is there sufficient system capacity to handle the load? They think we have x number of people, and they can do y number of jobs in a day, so that means they can get z amount of work done. So, if they are thinking 100% what happens if your utilisation of your capacity, or capability, exceeds 80% ? You get a traffic jam effect. You have no buffer for any variation. When something comes through the system, everything just gets clogged up and stuck, and nothing moves effectively. Queues start happening, or you start multitasking without getting anything done. Cycle time goes shooting up. Even 80% is high, If you target anywhere around 80% of your capacity the chances are that things just fall apart. We know this scientifically, mathematically we can prove this, yet mangers ignore it. If you work faster you are going to reduce quality. Instead we want to produce error free work, doing things right first time. This might prove more costly up front but saves us costs in the long run. This is exactly what Taguchi taught (the nominal value curve), what he won the Deming prize for, and what turned Toyota on its head where they redefined their definition of quality. You Burn it and I’ll Scrape. We need to understand variability or Mura. We need to understand the relationship between capacity and demand, by studying demand being placed upon us and the variation in cycle times. We need to work on unevenness by going into the work (the shop floor) and experimenting. Input / output. At a given input level (given capacity) maximise utilisation to increase output. What is the Real TPS (Lean)? The Core of Lean is NOT about reducing waste, its about increasing capacity. 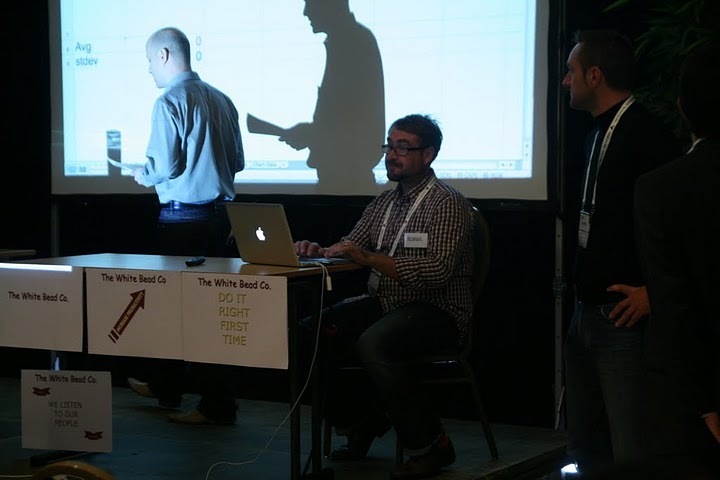 Here is a video of when I ran Dr W. Edwards Deming’s famous Red Bead Experiment at Agile Sydney. The quality of the filming isn’t of professional quality, but many thanks to Rowan Bunning for the ad-hoc filming. I ran the experiment last year at Agile Sydney, Lean and Kanban Belgium, LESS 2010 Helsinki, Agile Australia, and at a number of clients. The learning is always good, even more so when it’s a fun experiment to take part in and watch. The experiment is followed by a discussion on the theory of variation. Some great comments from those that attended. 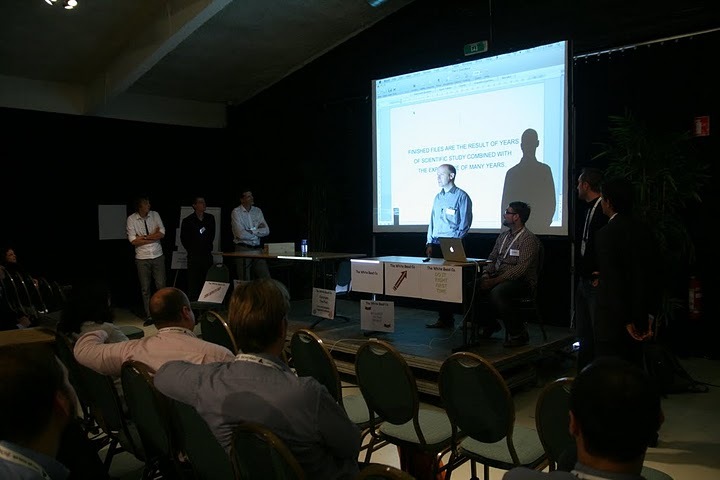 Here are a few pics from the Lean and Kanban conference in Belgium, where I ran the Red Bead Experiment and presented the closing keynote. Are You Target Driven or Customer Driven? 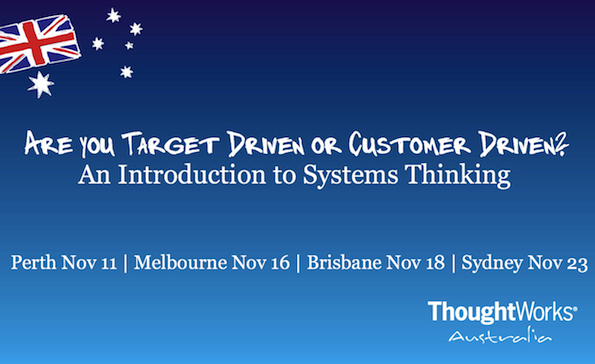 Below is a video of my recent presentation on Systems Thinking entitled “Are you Target Driven or Customer Driven” given round various cities for the ThoughtWorks Australia Quarterly Briefing. This recording was made at the Sydney breakfast briefing. The slides for the talk can be found here. This paper by Professor John Seddon and Brendan O’Donovan is a great read. An excerpt is below. …organisations where people continually expand their capacity to create the results they truly desire, where new and expansive patterns of thinking are nurtured, where collective aspiration is set free, and where people are continually learning how to learn together. … an organisation that is continually expanding its capacity to create its future. For such an organisation, it is not enough merely to survive. ‘Survival learning’ or what is more often termed ‘adaptive learning’ is important indeed it is necessary. But for a learning organization, ‘adaptive learning’ must be joined by ‘generative learning’, learning that enhances our capacity to create. …the most successful corporation of the 1990s will be something called a learning organization, a consummately adaptive enterprise. So why is it that these predictions do not appear to have materialised in 2010? Why do we not see examples of learning organisations all around us? Our prevailing system of management has destroyed our people. People are born with intrinsic motivation, self-respect, dignity, curiosity to learn, joy in learning. The forces of destruction begin with toddlers – a prize for the best Halloween costume, grades in school, gold stars – and on up through the university. On the job people, teams, and divisions are ranked, reward for the top, punishment for the bottom. Management by Objectives, quotas, incentive pay, business plans, put together separately, division by division, cause further loss, unknown and unknowable. It is our contention that Senge’s work did not tell managers how to tackle this “deeper layer of connections” that was necessary before they could become a ‘learning organisation’. However, a combination of the works of Chris Argyris (Argyris 1999) on intervention theory and Deming’s own systems perspective on management can provide us with a way forward. What matters to your customers? I love this story told to me by Bridget Kelly, a Systems Thinker, about what matters to your customers. A ten year old boy was strolling through the park. He was wandering aimlessly along kicking stones. The boy continued to stare at the frog in amazement. The frog pleaded again, “Kiss me, I’ll turn into a beautiful princess and do anything you want.” The boy simply tucked the frog in his pocket and carried on down the path kicking stones. “I’d rather have a talking frog” said the boy. So what matters to your customers?